Since his death in 1973 at the tragically early age of forty-four, the brilliant Jamaican saxophonist Joe Harriott has been almost forgotten, spoken of in either hushed and reverential tones or with scant and embarrassed disregard; his recordings – if ever found – have been listened to in the shadows like samizdat, or left to the cognoscente and the record collector. He may even have come to symbolise the great yet lost cause of British jazz: there is, after all, a poetic lilt to his troubadour-like life. Orphaned, rootless and intensely talented, he came to England in his early twenties, outshone its indigenous talent and tore up a storm; his near impregnable stature was subsumed by his reckless challenge to prevailing musical wisdom as he embarked on ‘free’ experimentation (or, as he preferred to call it, ‘abstract’, for Harriott referred often to the visual arts when describing his music, an important point which should be developed); bowed by a non-receptive audience, he became an itinerant outcast, seemingly out of kilter with the dictates of his day and attempting to keep a grip on musical fashion by dabbling with Indian raga; in his latter years he was destitute and unrecognised for what he had achieved, and acclaim for his work as being more than hollow iconoclasm was to follow only posthumously. His life is littered with tales of great achievement and an intuitive brilliance, yet underwritten with such bold individuality and forthright self-destruction that it compares to that of Charlie Parker, and allies him with Phil Seamen and Tubby Hayes in the annals of British jazz as something of a lost warrior. It has taken thirty years for Harriott’s story to be told; it has been eagerly anticipated. 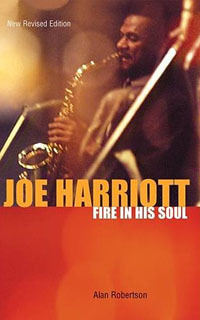 Alan Robertson has sought to put the record straight in Joe Harriott: Fire In His Soul, and has done so with relish. This book complements the Coleridge Goode autobiography, Bass Lines, produced last year by the same publishing house and is a “must read” for those interested in British jazz. Importantly the book makes no presumption that its reader is a die-hard devotee of Joe Harriott’s music; rather it seeks to present its case by force of argument, this the by-product of the author’s intent which, as he confesses in his introduction, was to slake his own curiosity. Having read Ian Carr’s Music Outside, which contained two sentences portraying Harriott (an off-stage character for this book), Alan Robertson has endeavoured to piece together Harriott’s lonely and bobtailed life, and we should be enormously grateful for this. He warns that writing about music is a poor substitute for listening to it and, having acknowledged that precious little of Harriott’s is extant in the catalogue, then proceeds to tell us very little about it, which is a great shame. But where the book has succeeded brilliantly is its exposure of Harriott’s impressive part in disentangling America’s almost vice like hold on British jazz in the 1950s. (Conversely although not surprisingly, critics and musicians across the Atlantic were to take to Harriott like no other figure from European jazz of the time: Down Beat awarded the album Abstract with a five star rating, and Mingus requested Harriott travel to the States to join his group.) When listening to his recordings of this period, it is obvious that his playing field was as level as anyone’s: indeed he had the declared ambition to become not only the equal of the best American soloists of his day, but much more besides. This competitive streak derived not from petty jingoism or a contrived rivalry (in fact Harriott had worshipped Parker and continued to do so) and certainly not from an egocentric view of the world – although Harriott was as self-centred and tarnished as any man – but an understanding of the vital and democratic heartbeat of jazz, that the voice of one man is as important as another. Robertson is bang on the button: “the players who have really evolved styles of their own are the first and last words on their subject,” and this gets to the very nub of Joe Harriott. Well structured, well written and concise (indeed the author’s minute-to-midnight interviews listed in the notes suggest that the publisher requested the book be fattened), this book is never bogged down with minutia. This highlights a problem with the anecdotal historiography though. Any biographer of Harriott has to deal with a myth that may have been exaggerated perhaps beyond substance and tortured by a sort of merry-go-round Chinese whisper that anyone can ride: everyone seems to have a tale to tell, often the same one, and that sometimes rehearsed in the after-hours snug of the jazz world. The early skeletal narrative of his childhood years in Jamaica is all but bare, understandably so; yet so too – and this more intriguingly – of his later years when, we are told, he begged, sponged, overstayed his welcome in the spare room of friends’ houses, and scoured the country for a desultory gig, a few coppers and a chance to blow. Certainly there is very little in the way of a confirmed timeline for the last five years of his life: a pottage of personalised and snapshot memories accounts for only a fraction of his time, and it may seem – especially to the newcomer to Harriott’s jazz quest – that only conjecture has joined the dots of his life. I am not suggesting that his last years were not as presented in this book or that there is evidence to the contrary, only that it is easy to translate folklore in to unquestioned fact. Harriott was notoriously private and prickly: even his regular work colleagues knew little or nothing of either his past or family and children, and he effortlessly compartmentalised his lifestyle. Most suggest that Harriott became more depressed and withdrawn as the 1960s progressed and that he held low regard for his physical well-being, damaged by both his lifestyle and various lung infections that had already hospitalised him. Yet it seems unfair to assume that Harriott was always as down and out and threadbare as often presented, and I am not convinced that the complete man has emerged through the narrative of what was a patchwork life: it is possible that there are those who met and knew Harriott away from the jazz world to whom he presented a different side. It will be of little surprise then that Alan Robertson’s book tells us no more of his character – moulded from a troubled childhood with scant emotional security – than we surmised already, but the absence of hard historical fact can strike a disabling blow, and the Joe Harriott portrayed in Fire In His Soul remains an enigma, although through no fault of the author whose copious source notes at the rear of the book have let it be known that he has sought to leave few stones unturned. In general terms Alan Robertson has tackled most issues with a steady hand, wisely steered clear of amateur psychology, tapped trustworthy sources and given a fair and proportionate account of Harriott’s career, especially in the early 1950s when he was finding his way in London’s labyrinthine jazz world. Born in Kingston, Jamaica, the eldest of four children, Harriott was raised in an orphanage with strong musical leanings; the Catholic Alpha School was a seedbed of budding musicians, some of which came to reside in England. He played first the clarinet, and took up the saxophone when in his teens. He was well tutored in music theory, composition and arrangement, and had many opportunities to play in local orchestras and dance bands. Disciplined and unstinting in his practice, his industry combined well with natural talent, and in 1951 he came to London with the Ozzie Da Costa band; here Dizzy Reece took the young Harriott under his wing, and Da Costa’s band moved on to Germany without their star saxophonist. Memories of him at this stage in his career suggest that he was fully developed, certainly technically, but also secure in his own style with mannerisms derived from Parker’s acrobatic bebop language. He honed his craft, impressed in many after-hours sessions, recorded under his own name [the EP Cool Jazz with Joe from 1954 has not long been re-issued and is a useful starting point] and in 1955 joined Tony Kinsey’s group for eighteen months. Robertson’s grasp of the narrative is sound, and whets appetites for further reading of the early and mid-1950s London jazz scene with its proliferation of small clubs and coterie of forward thinking minds. Harriott was indeed a player around whom an astute leader could meld a group, and what shines through the narrative is Kinsey’s comment that “Joe was a real catalyst.” His ability to be noticed – not least because of his technical prowess but also his stature, stylish dress and confidence – meant that he was fast becoming hot property in British jazz circles by the late 1950s. Robertson’s narrative of Harriott’s innovative quintet is compulsive. It was formed in 1958 and quickly established itself as one of the leading small combos of its day, meeting applause and favour. It took up a residency at The Marquee, the new prestigious venue established by the National Jazz Federation, impressed Horace Silver at the 1959 San Remo Festival (Silver sent on to Harriott many of his scores) and was chosen later to tour with Brubeck. Robertson suggests that the seed of Harriott’s revolutionary work first blossomed in 1958, when Harriott delineated his free form ideas with members of his quintet; it was only when he had assembled a compatible and open-minded group that the experimentation begin in earnest. The group’s line-up was fluid, but became more settled when the inestimable Pat Smythe took on piano duties and trumpeter Shake Keane joined in 1960; Coleridge Goode on bass and Bobby Orr – later Phil Seamen or, if he was indisposed, Tommy Jones – on drums completed the rhythm section. Alan Robertson has chosen not to place Harriott in a wider context: there is neither an assessment of Harriott’s impulses and how they may have fed his need to stretch his musical horizon, nor his social background and circumstance, and in what manner these differed from, or were similar to, those of Ornette Coleman. Although there was undoubted interest and, at first, good will, it was not long before Harriott’s forays in to ‘abstract’ form fell upon stony ground. Perversely it seems that much criticism came from within the jazz fold and it is difficult to avoid the conclusion that professional jealousy played a part: Harriott’s improvisatory skills and the authority of his intense playing (which at its finest is so reminiscent of Parker) always shone through and would have threatened others less secure. Moreover, although courteous in behaviour, Harriott was never a sociable figure: “he didn’t make any effort to become one of the lads,” Michael Garrick told Robertson, “and that’s very important in British jazz.” Nor did he ingratiate himself to club owners: “he was a bit of a maverick and fell foul of various promoters,” says trumpeter Del Turner. Racism, too, argues Robertson, was prevalent in some quarters, and Coleridge Goode likens Harriott to guitarist Lauderic Caton, whose musical career was thwarted by these overtones. Certainly Harriott himself was sensitive to such rebuff, although some of his contemporaries have contended that Harriott’s own personality was enough to queer his pitch. Perhaps Harriott’s Achilles’ heel was his own taciturnity: he could only present his music at face value. His playing was, after all, never anything but visceral, his jazz never a moral or intellectual exercise, and he had never played by numbers: humour and engagement, two of the qualities he so lacked in life, were bubbling always at the music’s surface. He never sought intellectual justification and perhaps lacked the armour it can provide against oblique or even hostile criticism. Alan Robertson quotes Steve Race who, when reviewing one of the quintet’s performances, contended that to have a composed theme to which performers returned to after their collective improvisation as though it were standard jazz fare, was not a coherent rationale, and argued that Joe’s ‘free’ form music was in reality anything but, for it relied on a basic pulse and even, through the backdoor, conventional harmony. 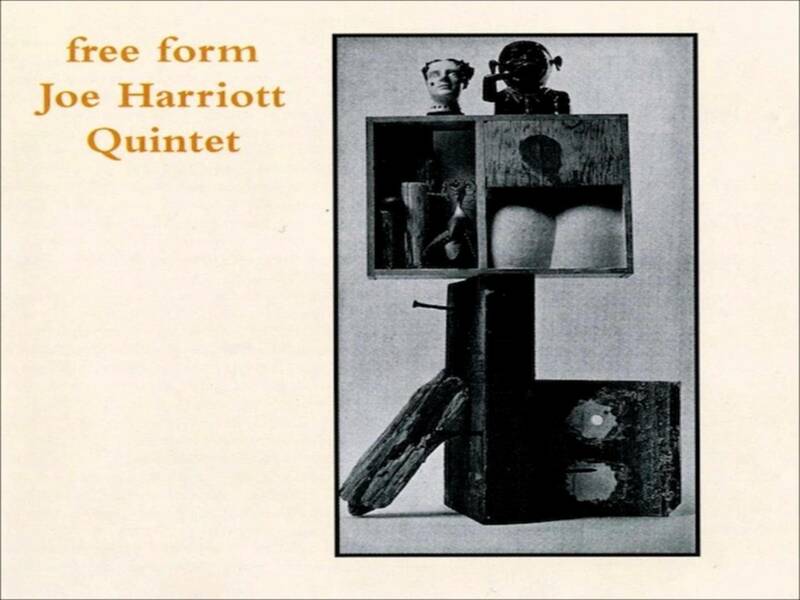 Such criticism, of course, missed the point, for Harriott’s introductory statements served a purpose beyond affording each piece its title, rather lending an ambience and perspective for improvisation by association; moreover its backbone was communal and collective, each player feeding off the other, and in this respect it differed from Ornette Coleman’s American counterpart. Harriott could trace the lineage of his music back to New Orleans and its early jazz stompers, and it is ironic that Harriott the soloist, as provocative and supple musically as a gunfighter from the Wild West and full to the brim with ideas and the technique to exploit them, was at his best when engaging with others in a true improvisational ensemble. Harriott’s early death compounds the problems confronting a biographer, for he carried into his afterlife a burden of expectation from a life that remained essentially unfulfilled. That he was pivotal in establishing a distinct brand of British, even European, jazz is certain; that he developed, independent of Ornette Coleman’s free jazz radicalism, a new way of looking at musical form and jazz improvisation makes him seminal; that his Indo-Jazz fusion project was both groundbreaking and an early venture of ‘world music’ may be open to debate. But that he was a musical triumph is undeniable, and the tragedy is that despite over twenty years performing and recording there is no greater body of work left to posterity, and the surprise that his only truly significant recordings, for all the brilliance of his earlier playing, are Free Form and Abstract recorded between 1960 and 1962. He was sidelined for much of the last decade of his life: the group Indo-jazz Fusions (with the impressive John Mayer as senior partner) appealed to the burgeoning hippie generation of the time and was well thought out and entertaining, but if it provided Ask The Family with a signature tune it never challenged Harriott, who continued the struggle to redefine a career after his ‘abstract’ adventures. As Alan Robertson makes clear, his personality and individuality eventually sank every group he led or played with, although his groundbreaking quintet soldiered on for seven years. 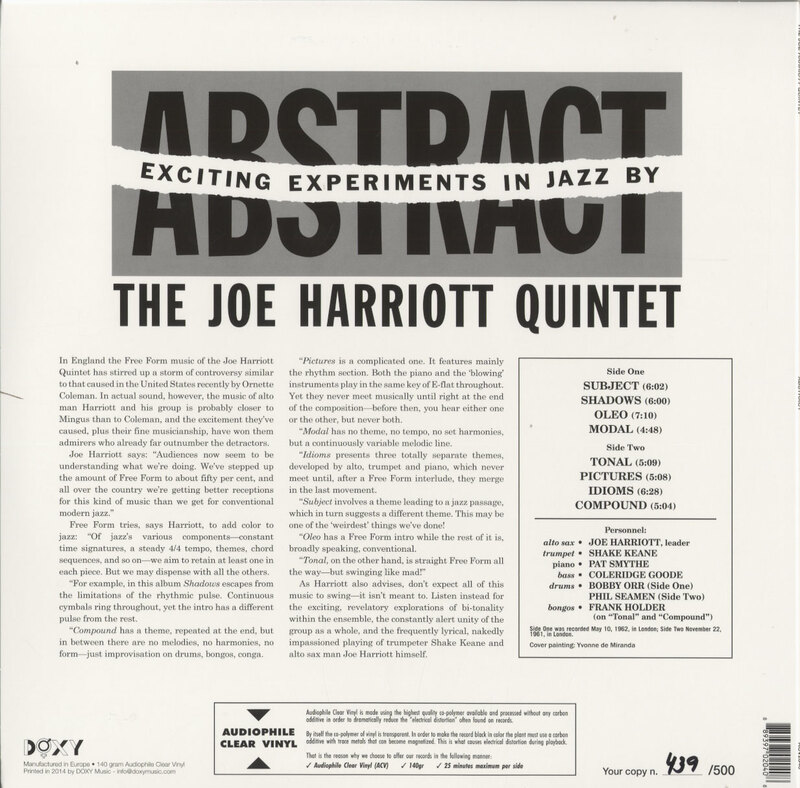 A lack of a consistent forum to showcase his ideas inhibited his development as a jazz strategist and composer, and, more importantly for Joe, an appreciative audience was hard to come by; from the mid-1960s free form was banished from the quintet’s repertoire. Hitherto there has been a tendency to revere his playing to the exclusion of all else, although his playing was incomparably fine. Yet his unique talent was composition, if not in the accepted sense (there will be few jazz clubs brave enough to take up Michael Garrick’s ‘Year of the Harriott’ enterprise this year!) then in its open-minded, open-ended and all-embracing approach to jazz performance and ensemble playing. It presaged and even inspired much that was good in the years that followed, from Graham Collier’s broad brushstrokes and Garrick’s invention, to Courtney Pine and the refreshing jamboree that is Soweto Kinch. These catholic and vigorous approaches to jazz are part of the same mindset that allowed Harriott to play both traditional and modern jazz with ease and purpose, to mix abstract and standard numbers in the same performance without a blush or concession to the audience, and that made him one of the most singular and inventive of voices in his, or indeed any, era of jazz. As trivial asides, Skip Conway’s account, at least as written, of the first meeting of Joe’s children (those known at the time) may not be correct, and Joe’s missing saxophone, which was given to Teddy Layton by Joe on his deathbed and not passed on to his family, is a great and careless loss. The enterprising Northway Publications of North London is responsible for this book which is well presented on nice clear paper in sound binding, not inconsequential points in today’s inadequate publishing world. There is – joy of joys – an index; alas no full discography is included, perhaps not requisite, but desirable and always a useful compass to complement the text. It will be a while before another book on jazz as enjoyable as this one is published. Saw Joe several times at The Marquee in the sixties, with the classic band including Keane, Goode and Orr. Always thought Orr was a little bombastic, but it was a fantastic band led by a real innovator. Glad to see a little belated recognition. 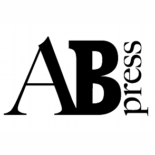 This entry was posted on 23rd February 2015 by admin in book review, jazz, Joe Harriott, music and tagged book review, jazz, Joe Harriott, music.